When was the last time you cried tears of joy? For me, before this last weekend, the answer was once, when I summited Katahdin and completed my thruhike of the Appalachian Trail. If I am honest with myself those weren’t even tears of pure joy, there was something sad about them, something devastating… but more on that later, for now we are focused on my recent and new experience: tears of joy. But before I tell you about the tears themselves let’s rewind to the beginning of the weekend and the start of our graduation climb for Boealps: an attempt at the summit of Mt Baker via the Coleman-Deming route. After another sleepy and early car ride with our best carpooling buddies, Sarah and Carl, we arrived at the Heliotrope Trailhead at 8:30am and although we had to wait for our head instructor to show up (he and his wife were busy saving a dog) we got started around 10:00am. The climb itself is about 11 miles and 7,000ft of elevation gain. The first 2.5 miles or so are on trail and we didn’t encounter any snow until the top of the climbers trail when we stepped onto the glacier. The climbers trail itself shoots off to the right from the main trail at about 2 miles and is very steep all the way up to the glacier. At the edge of the moraine we roped up and headed up to camp. We had planned to camp around 7,100 ft directly under Heliotrope Ridge and once we got there we found the perfect spot, far enough away from the rocks to avoid rock fall but off of the glacier. We arrived around 2:00pm, set up tents and dug ourselves the most luxurious snow kitchen, topping it with a Black Diamond Mid for sun protection. We then spent the next three hours boiling water, laughing, and rehydrating our respective dehydrated meals. Outside the shelter it was broiling hot in the sun, but inside the shade we could see our breath. Around 7:00pm water had been boiled, an entire jar of Nutella consumed and we all headed to our tents to try to fall asleep. I slept restlessly. I kept dreaming of crevasses and ice fall, and then, around 11:00pm a huge rock fall right next to our camp woke me up. I got out of the tent to pee and was shocked to find that the sky still had some light in it. Vancouver glittered below. It was incredibly beautiful. When the alarms went off at 12:00am there was no warm glow of sunlight left, only the cool white light of the moon and the glittering stars far above. The moon was on the other side of Heliotrope Ridge, casting long shadows of the peaks down onto the Coleman Glacier bellow us. We got dressed quickly, and tied into our pre-determined rope teams. We had decided the night before that Sarah, Carl, Kyle and I would be climbing on a team together, with Carl bravely leading our march up the glacier. In a move, uncommon for the class, Dana (our lead instructor) had decided that the first two rope teams to ascend would be made up entirely of students and a third rope team of instructors would bring up the rear. In this way we, the students, would be on our own, navigating our way up the mountain with the instructors there to bail us out if need be. 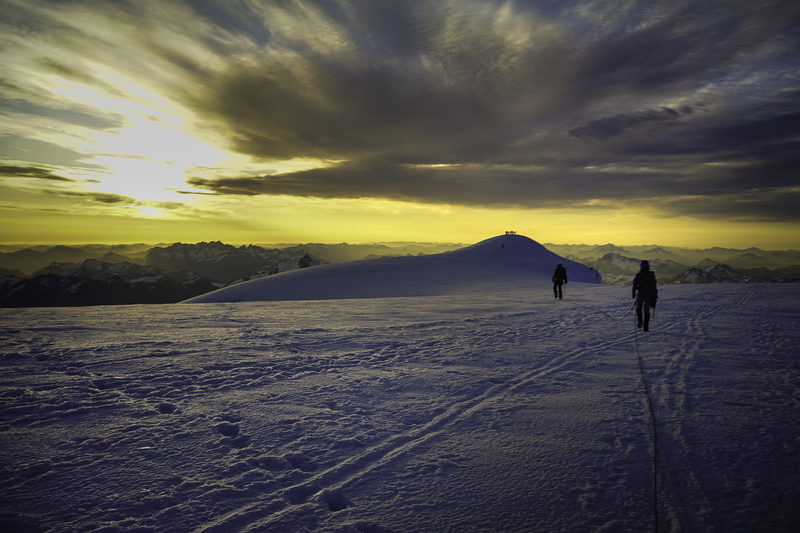 We got started right at 1:00am, as planned, and began walking across the dark glacier towards the summit. The night was warm as we walked between pools of shadow, where your only light was the orb around you cast by your headlamp, and rivers of light made by the moon, turning the hard snow into crushed diamonds. I flicked my headlamp off in these sections, and then flicked it back on as we passed into shadow, scanning for crevasses and chatting with Jordan, the leader of the second rope team who was hot on my heels. Carl would call back to warn us about snow bridges but even as I passed over the caverns that I knew existed beneath my feet I felt calm, at ease, safe. There was so much rope between me and Kyle, and more between him and Sarah, and Sarah and Carl. I trusted these people I was roped too. Trusted that even if I was to break through the firm and crusty surface that felt solid under my crampons they would catch me, and they would pull me out. But the snow bridges were strong and after a very long walk we reached the saddle and began to climb up the ridge towards the upper Deming Glacier and the Roman Wall. Until now the climb had been fairly mellow and low angle but here it increased and the steps that had been kicked previously had apparently been made by a giant. They were at least a foot and a half high, making it hard for me to keep up with Carl, and his long legs, in the lead. I had to constantly ask for everyone to slow down so I wouldn’t wear myself out, trying to abate the tightness in the back of my throat and avoid full-blown nausea. Being on a rope team is difficult. You are often accidentally tugging on the person in front of you or giving them too much slack, which you are trying to avoid at all costs. When you feel a tug on your harness you don’t know how to interpret it, do I need to go slower or did they just step on the rope? When the leader crests a ridge and gains flatter ground they often speed up without meaning too, pulling the others on the rope team up the hill bellow at a near run. Despite it being our first real time on a rope team we managed it well and had excellent communication. We reached the summit plateau which is huge and flat, and began to head across it toward the tiny little mound that stands above the rest, the summit itself. It was upon cresting the ridge and finding myself on top of the world that I finally stopped to look around. The sun was just up, lighting up the surrounding mountains in a fiery golden orange blaze. The mountains themselves maintained their dark shadows and deep blue valleys, contrasting the brightness of the sun and creating an unreal landscape. The sun itself was bright and warm on my face, so new to the day, back again, a reliable companion to this massive mountain that we were now standing on top of. And I cried. I just stopped, took all this in, sucked in a breath, and joy welled up deep inside me and I cried. As I said before, I had cried tears of happiness on top of Katahdin, but they were also tears of many other things, they were tears of sadness that such a great journey was over and tears of weariness, and tears of pride. These tears, on top of Mt Baker were the real deal, they were really tears of joy. I felt elated, like I could jump and hoot and pound myself on the back. But instead I just stood there looking at one of the most beautiful views I have ever seen and cried because it felt so good to have gotten there. I felt proud that I had never given up on climbing mountains despite all the fear I had felt over the last few months. I felt relieved and amazed that I had felt no fear or stress or regret on the way up to Baker. I felt reborn, bigger and stronger; I felt my edge had grown and I wondered at what I could do now that I couldn’t do before. I never expected that moment to be one of the happiest moments of my life but it hit me out of no where, hit me full force with all the happiness that change can bring. I stood there, tied by a rope to one of the most important people in my life, and was thankful for Kyle, who pushes me to do things like sign up for a mountaineering course. More than ever, I saw on that mountain, the incredible personal gain one can receive if you don’t let fear prevent you from taking risks. Obviously I wasn’t thinking all of this in that moment though, I was just crying what I knew to be tears of pure joy. 5:30am: The summit itself, only a hundred feel higher than the plateau, was bitterly windy and cold, forcing us off of it after a couple of minutes of picture taking. A few people were suffering from nausea and potential AMS so we headed down after a short break and some summit treats (Piotr brought caviar which Dana tried and then declared the grossest thing he had ever put in his mouth). We descended the way we had come up, passing party after party of fellow climbers, all headed for the top. Even in the daylight the crevasses remained benign, still holding their mystery and their power, but not playing with my nerves the way they did that first time on the Nisqually Glacier. We were back in camp around 9:00am and packed up and heading down around 10:00am. We did lunch in Glacier at 1:00am, eating, what seemed like, our weight in fried food. The graduation climb was a success. For me though, reaching the summit was just part of the vicotry. The real success was climbing without overwhelming fear or worry. Does that mean I will never feel those things in the future? Of course not, I am already looking forward to our climb up Rainier on July 4th with nervous energy but there is something a little different about my feelings now. I have traded straight up dread for excited anticipation. I once said I would never climb a mountain like Rainier, never go near a crevasse, never do things with crazy exposure. Who am I now? Yesterday I told Kyle I was bummed we weren’t climbing anything this weekend and, something must be wrong with me, because the idea of a simple day hike was starting to sound kind of mundane. This is not the girl I was four months ago. PS I hope to never become someone who actually thinks a day hike is mundane. Any opportunity to get out and explore and enjoy nature is an amazing opportunity, no matter what speed you do it at or what level of risk you take. I hope there are many day hikes in my future, and I promise to never become a snob about how one enjoys the mountains. Giant crevasse, you don’t scare me! Freezing our asses off on the summit. About to get onto the glacier. The view that made me cry on the summit! One of our fearless instructors, Andrew! Relaxing back at camp after summiting. Selfie with the rest of the rope team. Trying to go to sleep in the daytime. There is some pretty cool stuff on glaciers. About to get on the glacier. Waiting for the other teams. In the kitchen boiling water! The view that made me cry. Congratulations, that is an amazing feat and well worth tears of joy. Being from Vancouver I often admire the views of Baker off pin the distance, to be able to say you hiked it is an amazing accomplishment. Another great summit. And what a weekend for it. Really like all the pics. I’d like to try that route sometimes. It seems like lots of fun. Wow, fantastic! I love your journey! I’m bagging my first peak later this summer and I’m really stoked. So fun to follow your adventures!